Two years ago, Derek Gabriel was attacked and stripped of his humanity. Nicky Peyton was born that way. Derek comes from a family of psychics who, besides his cousin, are all dead. Nick is the daughter of the Alpha wolf of the country and leader of his people. Derek's considered a mutt among the elitist snobs in Nicky's culture - and Nick's considered a princess more valuable for her womb than her personality. There love is primal, instinctual...and doomed to failure. Just when they had finally decided to stop tiptoeing around one another and give in to all their worst - and best impulses, Nicky's twin sister and very powerful Seer shows up on Nick's doorstep. Michelle is pregnant, her magic is out of control, and Aaron, the father of her child, as well as her bodyguard and mate, has been labeled a traitor for giving in to his heart and now has a bounty on his head. Nicky may be the daughter of the Alpha and she's at home in a world of insidious politics that makes Derek's head swim. Derek doesn't care. He knows only that Nick is his. His. But to save her sister, her twin...and to save the lives of her unborn child and the man that Michelle loves...requires a sacrifice that only Nicky is able to make. Nick has to give up everything that matters to her - her independence, her livelihood, her freedom...and especially her mate. Credit is due Moira Rogers. She writes a heck of an action-packed, intense story full of impossible choices and difficult decisions. The politics of the conclave is just as destructively convoluted as it is in any nation's capitol and just as couched in bigotry and fear and history and bad habit. 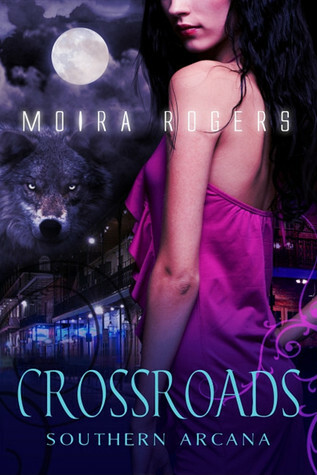 Crossroads truly is a study on how positively uncivilized the most civilized behavior can be. In that regard, Crossroads is a success. 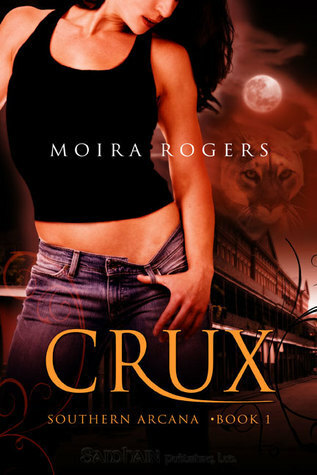 And that's the problem I have with Crossroads, and too the first book in the series, Crux. Any transition from one bad thing to the next, or one good thing, actually, as the plot barrels up and down the track is virtually non existent. There's not much exposition...because there's not enough time. Not a whole lot of world building, either, or character development. In fact, if you weren't already familiar with the characters going into this book, you're probably going to feel a little lost. I'd suggest starting with Crux, though admittedly, the writing style is consistent in that book as well so there isn't a significant amount of definition, character description, and exposition there, either. Regardless of that, it's not a bad story. It's more tightly plotted and more evenly paced than the first book, and the threat and danger is definitely threatening and dangerous. There is a lot that happens, the plot is really packed in tight between the covers of the book. Not everything was necessary to the plot, and honestly, I wish some of the scenes had been cut to allow for more development between Derek and Nicky, because with everything that went on around them, their relationship was very cut and dried and very abrupt. They weren't together at all, but wanted to be...then they were together and it was intense and perfect...then they weren't together and it was hell...and so on... Like every other aspect of this story, it is all peaks and valleys - and those peaks and valleys are fine...some are even great, but for me, a book has to have more than just the highs and lows to feel like a complete story. There has to be some development of the world, some explanation of the culture, some exposition and narrative that doesn't just thrill as you soar or make you scream as you drop. I also want to say, on a strictly personal level, that I can't think of a single shapeshifter culture in any of the many, many books I've read that include them that I would want to be a part of less than I'd want to be a part of the one in this book. Power struggles and political machinations I understand, but this is the second book in the Southern Arcana series and I'm still wondering what the hell good the Alpha is and what's the point of holding that position. It certainly doesn't seem to come with any perks, and in fact can't even secure the safety of the Alpha's own children without turning one into a political prostitute and the other a sacrificial lamb. There is nothing at all endearing about the elitist group of slavering sycophants and backstabbing monsters. I agree with Nicky...it would be better if they still ripped people's arms off and ate their enemies...at least it would be more representative of what's beneath the nice suits and platitudes. Creepy world. One particular high point that I wanted to mention was how Rogers differentiated between a born shifter and a made one. There were a lot of really good moments between Derek and Nicky - some they discussed openly, some just for the reader's benefit - that allowed for a very detailed picture to form of the scope of the differences inherent with brutally going from human to shifter that made a lot of sense and provided some of the nicest touches in the narrative through the whole book. I very much enjoyed those moments. Still, I would have felt the book more complete if it hadn't been quite so action packed and instead spent a bit more time defining the world, the developing the characters, and easing into and through the relationship. And a smooth transition between scenes or plot threads or just different intensity levels wouldn't be amiss, either.